Someday we won’t need curtains or blinds on our windows, and we will be able to block out light—or let it in—with just the press of a button. At least that’s what Keith Goossen, associate professor of electrical and computer engineering at the University of Delaware, hopes. Goossen and Daniel Wolfe, who earned a doctoral degree from UD last year, developed panels that can switch between allowing light in and blocking it out. This “smart glass” technology could be utilized in eco-friendly windows, windshields, roof panes and building envelopes, absorbing light and heat in the winter and reflecting it away in the summer. Although Goossen isn’t the first scientist to make smart glass, his team’s invention is about one-tenth the price of other versions. It is also more transparent in its transparent state and more reflective in its reflective state than competitors, he said. 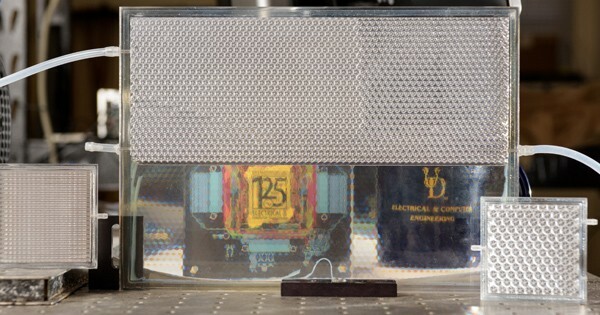 Goossen shared his latest smart glass prototype on Monday, March 5 in a keynote address at the SPIE Smart Materials and Nondestructive Evaluation for Energy Systems IV conference in Denver. The principles behind this smart glass technology are surprisingly simple. It starts with two sheets of plastic separated by a thin cavity. The plastic contains tiny cube-shaped structures that make the material retroreflective, meaning that it bounces light back to its source, like a bicycle reflector does. Then the chamber is filled with a fluid called methyl salicylate—an inexpensive wintergreen extract that happens to be the active ingredient in some over-the-counter pain relief creams. This liquid has optical properties, or interaction with visible light, that match the optical properties of the retroreflective plastic. When combined, the light can pass through, and the system becomes transparent. This is called refractive index matching. Goossen’s smart glass system can switch from transparent to reflective a thousand times without degrading, as shown in a paper published late last year in the journal Optics Express. At this week’s conference, Goossen revealed a new, improved design. Instead of utilizing cubes, this smart glass relies on the total internal reflection of one-dimensional structures layered perpendicularly. It is highly reflective at up to a 60-degree angle of incidence, an improvement over the previous prototype. “It performed better than we thought it would based on our theoretical understanding,” he said. Goossen uses 3-D printing to make his prototypes, but this technology could eventually be manufactured at a high volume and low cost using injection molding. He is now testing his system over a wide range of temperatures to see how it performs, especially as it approaches temperatures that could cause the fluid within to freeze, which will be between 3 and 16 degrees Fahrenheit, depending upon the eventual fluid that is used. Every time Goossen talks to a roomful of engineers about this project, hands go up with lots of questions. “There is a lot of interest in the capability this might represent,” he said. Commercialization may eventually follow—something Goossen is already well versed in. An author of 82 issued patents, he founded a startup company in 2001 that was later acquired. He passes his knowledge along to students as a co-teacher of High Technology Entrepreneurship, a course for undergraduate and graduate students that focuses on financial, legal, scientific and engineering issues facing tech startups. Goossen also encourages students to be curious. This research project started with a hunch, which can be the impetus for scientific discovery. “Sometimes it’s just an instinct about what might be interesting,” said Goossen.